In the first half of the 20th century, the bishops of West Virginia wanted to create a series of summer Christian education conferences in a setting that would encourage serenity and inner peace. The bishops explored many sites throughout the state before they came across 50 acres near Romney, WV that were for sale. 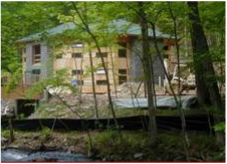 The site was rich with possibilities for nature walks, hiking trails, camping, and the building of cottages and other buildings. The land was bought – the bishops also leased an adjacent thousand acres of farm and timber land – and the Camp Peterkin Camp & Conference Center was dedicated on June 26, 1947. The Center also holds a series of popular summer camps for youth, adults, and families. The Center’s motto is Living Under Grace, and time spent at Peterkin is a reminder of how important that simple phrase is.